There is the saying, "Birds of a feather flock together." I think this applies to to generations too. Likely that geezers of a generation gather together. Perhaps the reason for this assemblage is the shared memories of that generation. When I go to Cornell to work on my emeritus related projects my routine includes a morning coffee break and a noon lunch with geezer faculty. We naturally have much in common with long careers in academia followed by retirements that include continuing intellectual activities. Some of my colleagues have moved to emeritus status via phased retirement. This permits a transition from full time to half time for five years and then full retirement. Those of us in our 70's have a shared history at Cornell so we have lot of common memories. As we enjoy the socialization of coffee and lunch we can test the authenticity of our memories and ponder whether the university is advancing or declining. Whatever the case we do have interesting discussions and frequently diverse interpretations of past events and their impact on the present. Sometimes our discussions are not so ivory tower. Today, those of us who grew up on farms were reminiscing about pitching manure. The lead in to this mundane recall came from one colleague's earlier research on the impact of animal agriculture on phosphorous run off into our streams and its influence on water quality. 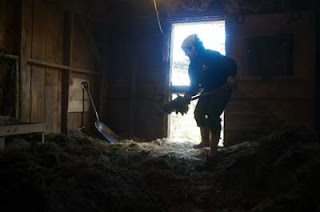 Last night I had a dream about pitching manure out of the barnyard of my home farm when I was a boy in upstate New York. A colleague who grew up in the state of Washington on the other side of our nation related a similar experience of pitching manure by hand. An interesting common thread of our mutual existence. What a leap of existence it has been for many of my current social circle of Cornell geezers to go from farm to academia. Five of the seven colleagues that I interacted with today are first generation off the farm people. Although we have a lot of shared memories, we are also futurists as well. One colleague is an expert in sustainable agriculture and a National Academy of Engineering member. Another colleague is also a National Academy member and an international expert in water movement in soil. And another member of our coffee cabal often consults in India in irrigation for rice production to feed the world. What a blessing it is to have both memories and excitement about the future of technology and society.